Buy 1 for $18.78Buy 2 / Save $1.00!Buy 3 / Save $3.76! 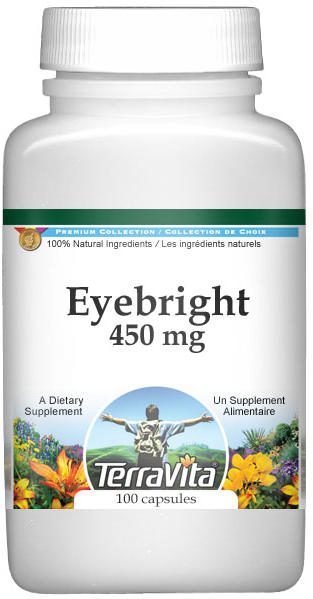 As its name suggests, eyebright is an herb with a long history of use in the support for eye problemss. Its botanical name, Euphrasia, comes from a Greek word meaning "good cheer", which is supposed to recall the gladness felt by those whose eyesight was preserved by this plant. The plant owes its use for pinkeye, or conjunctivitis, to its astringent and anti-inflammatory properties. Traditional herbalists also note that its flower often resembles a bloodshot eye, an indication to them that the plant is good for sore eyes. This harks back to the doctrine of signatures, according to which the appearance of a plant, or of some part of it, indicates its use in health. Eyebright was introduced into health literature in the works of the pioneering naturalist St. Hildegard (1098-1179). Its curative powers came to be so praised that the 17th-century herbalist Nicholas Culpeper claimed that if its use became general it would "half spoil the spectacle maker's trade." Eyebright is chiefly employed as an astringent and anti-inflammatory; its effectiveness for these purposes is most likely due to the tannin in the plant. An infusion of the flowering plant has long been used as a mild eyewash, and a tea made from the leaves, stems, and flowers to help support throat irritations. A delicate, attractive plant, eyebright is difficult to transplant because of its semiparasitical nature. Eyebright attaches itself by underground suckers to the roots-of neighboring grass plants and drains nutrients from them. To be cultivated, eyebright must be given nurse plants on whose roots it can feed. Range: Cultivated in North America, eyebright has escaped from gardens and is found wild in the U.S. Northwest and in British Columbia. Identification: A small, delicate annual, 2-8 inches high, eyebright has square, downy, branching stems. The leaves vary in shape, sometimes almost round, sometimes narrow and pointed, and are borne in opposite pairs. Tiny red or white flowers (June-August) have an upper two-lobed lip and a lower three-lobed lip and are borne in spikes from the axils of the upper leaves.